All safe. At the gate now. Departure from the Kraft was smooth and event free. It is an absolutely beautiful day in Firenze. Perfect for travel. 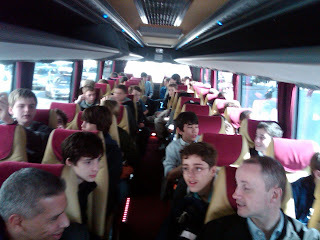 After Chapel in the median of Via Solferino, we boarded the bus for the airport. 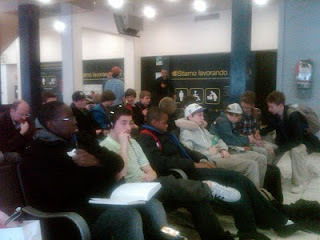 The boys are all through security and we are awaiting the boarding call for our flight to Rome. Spirits are high. Nicholas M. Reports he really enjoyed the trip, "Because I could learn outside of a school environment with my friends and see all the art we learned at school first hand." As the Palazza della Signoria was being prepared for the big celebration tomorrow——the 150 anniversary of the Unification of Italy—we were preparing for our departure. It is kind of ironic that Italy’s Unification is celebrated on the Irish St. Patrick’s Day, but, this is Italy, and what could be better! The rain that set in late yesterday stayed with us throughout the day—our first full wet day since leaving New York ten days ago. Try as it may, it didn’t disrupt our plans. A brisk walk across the Arno to view the fresco sequence by Masaccio, Masolino, and Filippino Lippi depicting the life of St. Peter in the Brancacci Chapel was followed by lunch at Palazzo Capponi. Below is a recap of the Capponi experience. In the pictures here, we see the boys in the cloister at Saint Maria del Carmine listening to a lecture after viewing the Brancacci Chapel. While at the palazzo, thanks to the generosity of a wonderful Saint David’s family, the boys viewed the magnificent ballroom of the palazzo decorated with frescos by the mannerist painter Poccetti. A visit to the Ufizzi brought our day to a close. After dinner, Colin J., Student Council President, hosted Final Festivities at Hotel Kraft, leading his classmates in reflections on their Italian Study Tour experience, and in song and dance. It was thoroughly entertaining and very touching. Rain threatened again today; but again it held off until late in the afternoon. 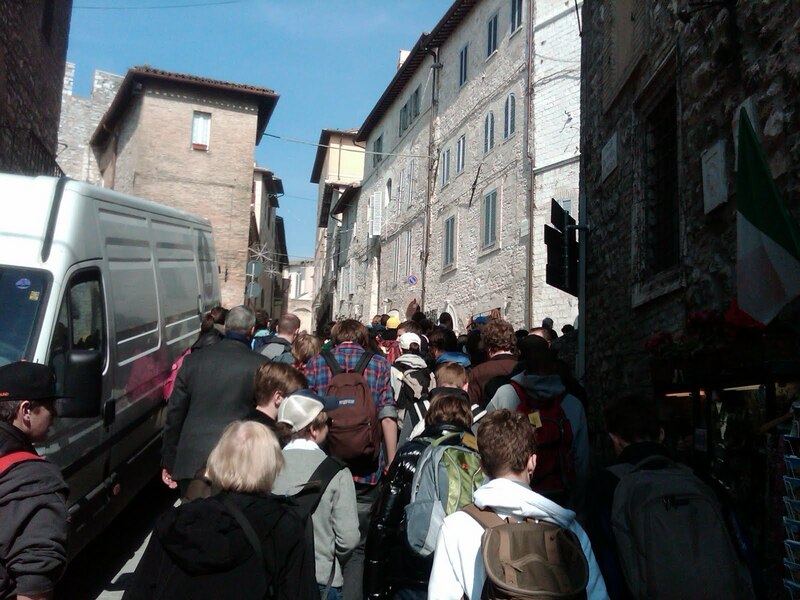 Day otto found the boys waking early, eating breakfast and after chapel making their way to The Accademia and The Bargello. The afternoon was spent playing sports--football, soccer and catch--in the drizzle. It was a little muddy, but that's okay. Above we see a photograph of the boys observing Donatello's David at the Bargello, the third David the boys have seen in situ this trip. 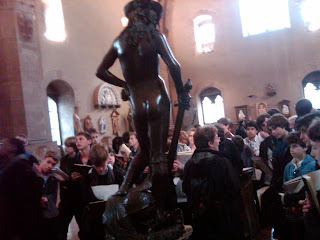 Time for sketching and discussing Michelangelo's and Donatello's David was exercised with great zeal. The boys' drawing skills have been refined and developed over the course of the trip. Below is Chris W.'s illustrations of Verrocchio's and Donatello's David. Confidence has grown significantly and the proof lies in the impressive product. Below is a "sideline interview" with a player from today's sports period--riveting entertainment. Don't miss it! You'll get a full accounting of the ebb and flow of today's game, including a few highlights and an inside perspective on many of the difficulties encountered by the players--difficulty identifying who was on what team, the slippery, muddy pitch, et cetera--on account of the complicating weather pattern that has settled itself over Firenze. Tomorrow promises to be another great day--our last. Even though the weatherman called for showers today, the rain was kept at bay by the gods until 6 PM. 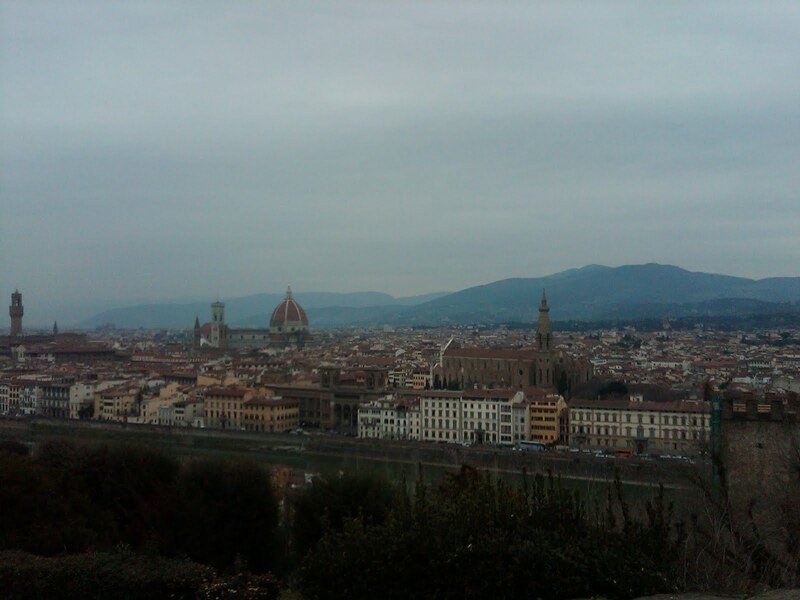 The broken clouds and periodic sunshine made for a perfect Florentine day. The highlight for the boys would have to have been their shopping extravaganza in the San Lorenzo Leather Market. In the video clip attached, some of the boys report on their hard-bargained purchases. An earlier breakfast than yesterday was followed this morning by a brisk walk to Piazza della Repubblica with a historical overview by our informative guide Ignazio. It was then on to Santa Maria Del Fiore to examine the architecture of the Basilica’s façade, Brunelleschi’s dome and the Tuscan Gothic interior. The boys also paid a visit to Opera di Santa Maria Del Fiore to view Donatello’s wooden Magdalen, Michelangelo’s Florentine Pieta, Brunelleschi’s and Della Robbia’s incredible choir stalls (Le Cantorie), and his, Pisano’s, and Giotto’s Campanile carved panels. The boys also sketched interior details of Brunelleschi’s San Lorenzo. Busy, busy! For class tonight, John W., following the lead of JC last night, presented 10 questions to test the knowledge acquired and attention paid by his classmates today. Outstanding, it was, and very humorous! John’s final question which was for extra credit “Today a bought a blazer. To quote Mrs. Iannicelli it was affare (bargain), and it was not cianfrusaglia (junk). How much did I pay for my blazer?” Unbelievably, more boys got this question right then any other question on the quiz. The correct answer was 40 euro. I suppose you had to be there to appreciate just how funny it was. Anyway, so went the day. Try as it may, the rain today did not dampen the spirits of the boys. High atop Giotto's Tower this afternoon, we see the boys enjoying the view of Firenze afforded those who make the 414 step climb. Our drizzly Sunday began with a traditional mass at the Church of Ognissanti, on the banks of the Arno. Although all in Italian, the boys gained a greater appreciation for the universality of Catholicism. After mass, we examined frescos in the nave of Ognissanti by Ghirlandaio and Botticelli. A quick walk across town to Santa Maria Novella followed where the boys examined the façade, and interior pieces by Massaccio, Giotto, Ghirlandaio, the apprenticeship work of Michelangelo, and Brunelleschi. Lunch at L’orenzaccio’s in the Piazza della Signoria was a blast. One of the waiters, impressed by the boys, decided to perform some “moves” and tell some quite interesting jokes and stories. It was on more than one occasion that the room erupted into raucous laughter. The rain may have been pouring outside, but inside it was all good cheer. After lunch all 37 boys and many faculty climbed to the top of the Campanile. Video above. Dinner consisted of penne alla carrettiera first, tacchino alla vernaccia with zucchine trifolate for main, and a mouth-watering tiramisu for desert. Class and a humorous quiz on the day designed by JC followed, and then all went to bed with full stomachs, stimulated minds and happy hearts. 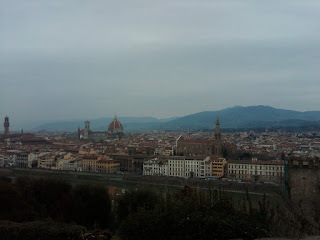 Some slides of the boys' first views of Firenze. The day is done and all have returned to their rooms. All are healthy, a little tired, but healthy. 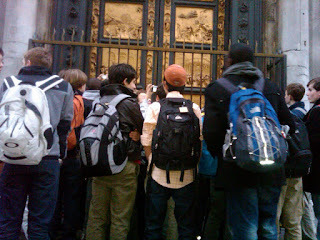 ... at Ghiberti's Baptistery Doors. Bigger then they thought. Danny J reflecting on his experience "The narrative was so clear. We studied them, I know; but up close the story is so clear." At around 5 PM we arrived in Florence--made great time from Assisi. Above is a view from Piazzale Michelangelo with its spectacular view of Florence from under a life-size copy of Michelangelo's David. We are on the south side of the Arno and will shortly make our way down into the town's historic center, via the Ponte Vecchio. Many caught some shut eye on the bus. Refreshed, they are ready for a hike. ... up the hill via San Francesco to the Basilica di San Francesco after chapel was a tough one. The boys then went inside to present their Assisi reports on Giotto's fresco sequence in the Upper Basilica. After a visit to the Lower Basilica, it was off the lunch at San Pietro. It's 12:30, Sabato. An early departure from Rome this morning placed us in Assisi by mid-morning. 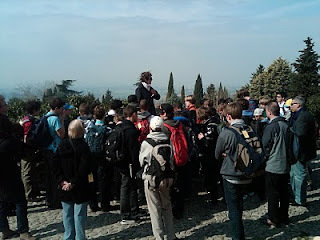 Here the boys attend chapel looking out over Umbria from atop the mount. Sunny, cool, clear day. After crossing the Tiber at Castel San Angelo and visiting St. Peter's Square, the boys settled down to lunch at L'isola della Pizza on via degli Scipioni, vicino Vaticano. We are en route to the Vatican. As is sometimes the case in Rome, the transporters workers union decided to call a strike this morning. The city is a mess, but we are effectively navigating the back streets of the Eternal City. All the boys are happy and well. This morning we visited San Pietro in Vincoli to see Michelangelo's Moses. Christopher W. reflecting on the Moses says "It was amazing and Michelangelo made many smart decisions." How so, I asked. "In his representation of Moses, it was all new-a new way." ... was fabulous. It began with the boys visiting Santa Maria Maggiore to view up close and personal the 5th century mosaics on either side of the nave that depict scenes from the Old Testament. The left-hand side displayed scenes of Abraham, Jacob and Isaac; the right-hand side, scenes of Moses and Joshua. Many of the boys, completely astonished, thought the mosaics were paintings. They also viewed the 13th century mosaics depicting the story of the vision and building of the church--a dream by a pope inspired by Mary to build a church where it snowed. On August 5th, believe it or not, on the Esquiline Hill, it did just that--and here the church of St. Mary Major stands today. The highlight of the day was at the Colosseum, late morning, when Coach Morales presented "A day in the life of a Roman" complete with an analogy to modern day sports--the gladiators are the athletes and Spike Lee, the coach insisted, with his special Garden court-side seats at NY Knicks' games, is the emperor. There were smiles all round as Coach related, and the boys visualized, the activities of the Colosseum two millennia ago as they stood where Vespasian, Titus and blood thirsty spectators all stood. After lunch, the boys moved slowly through the Roman Forum as Mr. Romanosky regaled them with ancient tales. The boys then chose temples and ruins to sketch and draw--incorporating in situ the specialized drawing skills learned in art class. All remain healthy, well hydrated and in great spirits. At the time of this writing, the group was preparing for dinner. 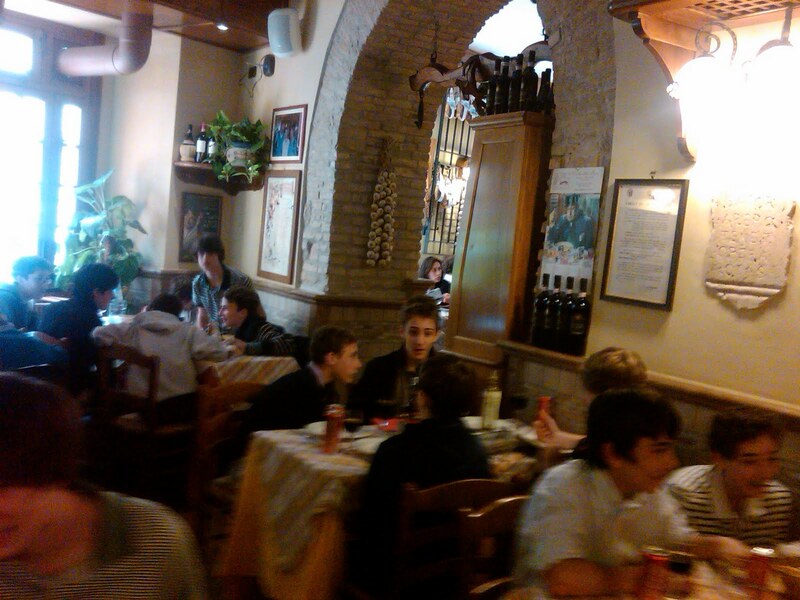 As I write this entry, the boys are sitting down to their first course of pasta in Italy. One of the boys, not keen for red sauce, has discovered the true beauty of fresh olive oil. His life has changed. 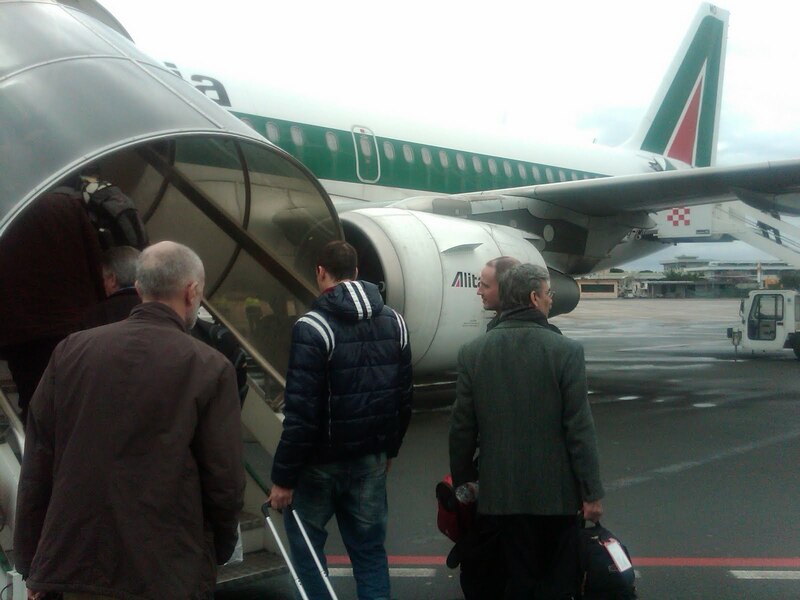 After a smooth, event free flight across the Atlantic, the boys arrived in a sunny Rome. There was no time for relaxing though. The Study Tour began immediately with visits to the Pantheon, Santa Maria Sopra Minerva, San Luigi dei Francesi and Piazza Navona. The boys were impressed by Caravaggio's 1599 The Calling of St. Matthew inside San Luigi dei Francesi. Caravaggio chronicles the moment when a typical daily routine is interrupted by something altogether different. The tax-collectors are interrupted! Fitting for this time of year. The painting captures the world of faith colliding with world of Levi. Incredibly, on their way to Santa Maria Sopra Minerva, the group stumbled upon a back door entrance to the church and the tomb of Fra Angelico. 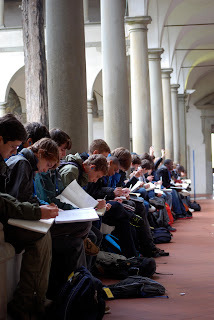 The boys loved the piazza in the sunshine and the opportunity to draw and sketch. Tonight, their first in Rome, will be an early one. For many they have not really slept for 20 or more hours. Day one is done. ... to Italy. The Class of 2011 left Saint David's this afternoon for Roma. 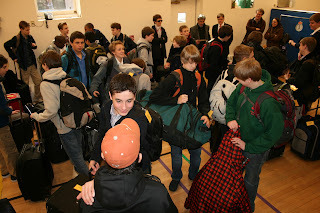 The boys were in high spirits, a little nervous and anxious, but excited. The teachers' faces too, reflected the anticipatory angst of the boys. The weather is perfect for flight and it looks like the weatherman is promising fine conditions throughout the trip. Florence will be a little cooler than Rome, but all sunny. Grant me, O Lord, a steady hand and watchful eye, that no one shall be hurt as I pass by. Shelter those, dear Lord, who bear my company, from the dangers of travel and all calamity. Teach me, to not miss, through love of undue speed, the beauty of the world; that thus I may, with joy and courtesy, go on my way. St. Christopher, holy patron of travelers, protect me and lead me safely to my destiny. Amen. At the time of this writing all the boys had checked in and were moving through security to the gate. In his 1911 short story, The Door in the Wall, H. G. Wells, through the eyes of a man close to the end of his natural life, reﬂects on a door he discovered accidentally in the earliest years of his childhood. The door led him to a garden of incredible beauty—a place of awe-inspiring wonder where even the air “exhilarated,” “gave one a sense of lightness and good happening and well being,” a place where he felt “exquisitely glad” and where “everything was beautiful.” Of all the attributes held close by those who ascribe to the classical tradition, the aesthetic, true beauty, lies at the epicenter. From the middle of the last century and now, embracing the dawn of the next, a mission driven commitment to the aesthetic is what has distinguished Saint David’s as a unique and marvelous school for boys. On the sixtieth anniversary of the school’s founding, we celebrate this attribute. The beauty Lionel Wallace, Wells’ protagonist, sought behind the green door, life’s quest ancient philosophers1 would argue, not only makes us happy, but also has the power to shake us up, confront us, and transform us. Like Wallace, we too have experienced this revelation when a painting, a piece of poetry or prose, an experience, or a person has exposed a previously unknown truth, portrayed something so uniquely or has touched us so deeply as to leave us speechless, awe-inspired or overwhelmed. When we come face-to-face with true beauty, time seems suspended and we feel ourselves transported to another place. The result: old beliefs, fears, and prejudices can give way. Old ways of perceiving the world can disappear. In order for this to happen, though, unlike Wallace, we must allow it, we must make time for it, and we must learn how to recognize it. Wallace searched often for the door in the years that followed his first encounter with true beauty but entering it again forever eluded him. On the rare occasions he did see it, he found himself too busy with the pressing needs and tasks of “his daily life” to stop, open the door, and experience the aesthetic. ... of Cardinal Cooke enjoy their time with the Saint David's Sixth Grade volunteers so much that tonight they invited their friends from other floors to join in our session. Typically, we visit with the 8th floor of the nursing home comfortably filling their common room. 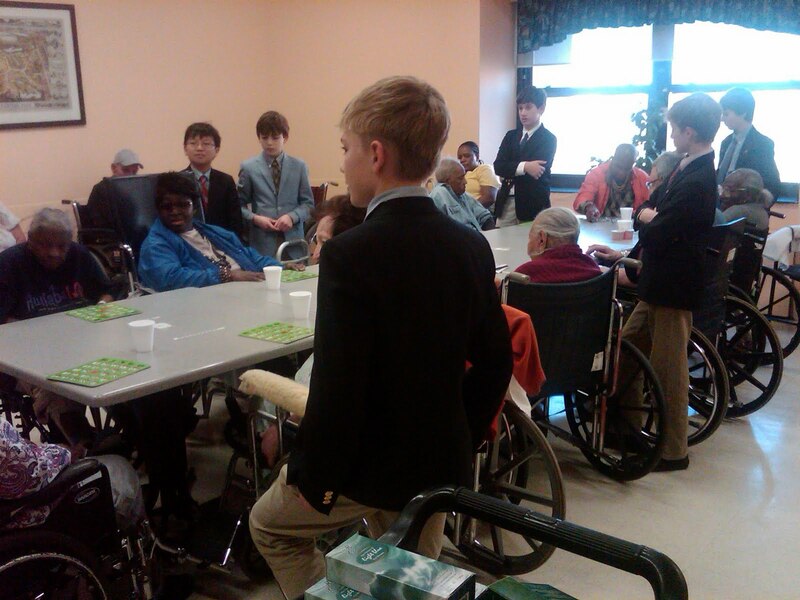 However, tonight, the room was jam packed as the boys led the residents in one of their favorite activities: BINGO. Tonight's game included a special twist--trivia. Get the question right and everyone wins. They just love it! As always, the boys worked closely with the residents, forging relationships, spending time with them in their home, and in the spirit of St. David's Day, the boys demonstrated what David of Wales challenged us to remember: an awareness of "the little things."